Thundershowers are expected in parts of the country today along with strong winds at times, the Qatar Met department has said. Offshore areas, too, are likely to experience thundery rain, windy conditions and high seas today, according to the weather report. 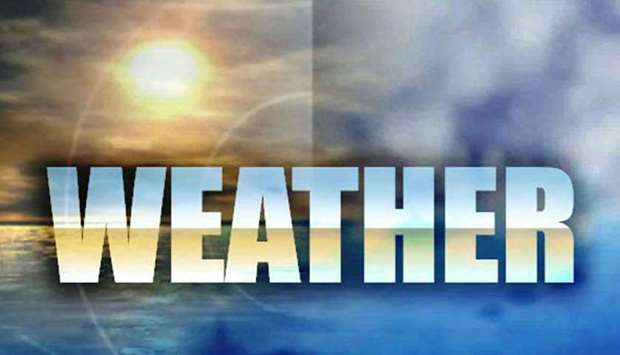 Earlier this week, the Met department had said unstable weather, marked by rain as well as winds and dust in some places, was expected in the country from today until the beginning of next week. In view of the expected conditions, the Met department had urged people to be cautious, check the weather before venturing into the sea and follow the latest updates through its official social media accounts. Doha and other parts of the country witnessed severe dusty conditions, poor visibility, strong winds and lightning on Monday, while moderate to heavy rain was also reported from certain places that day. Monday also marked the beginning of the 52-day Wasmi season in Qatar. Today, the wind speed may go up to 25 knots in inshore areas and 30 knots offshore during thundershowers, with the sea level rising to 9ft at times. The detailed forecast says relatively hot conditions will prevail in the country during the day. Scattered clouds are also expected and there is a chance of rain in some places, which may become thundery occasionally. Cloudy conditions are likely offshore, and there is a possibility of rain in these areas, too, which may be thundery in some places at times. A warning was also issued online, advising people who venture into the sea to exercise caution – especially during the afternoon and evening when thunderstorms are likely to form – in view of the unstable weather conditions expected from today until Monday, October 22. The maximum temperature expected today is 36C in Abu Samra, followed by 35C in Wakrah and Mesaieed and 34C in Doha. Yesterday, the maximum temperature was 37C in Abu Hamour, Mesaieed, Batna, Turayna and Karana, while in Doha it was 36C along with Sheehaniyah, Abu Samra, Al Khor, the Qatar University area and Jumayliyah.